To implement Events for your native (iOS/Android) extensions, you would need to know how to get the Objective-C (or Java) code to send notifications back to Haxe. For example, if the player completed an in-app purchase, you'd want to inform the player if the purchase succeeded and do something in-game in response to that. Note: Refer to the purchases extension for a real example of how to send data back from Objective-C/Java to Haxe. Recall that in Haxe, we set up function pointers to the C++ layer and can specify how many parameters are passed in. What we can do is pass in a pointer to a callback function. In other words, we can pass in a Haxe function that will get called back when the time is right. Here is the Haxe code that does this. In this code, set_event_handle() is a C++ function that we use to pass a pointer to notifyListeners() to the C++ layer, so that the C++ code can call notifyListeners() at the right time in the future. notifyListeners() takes one parameter - a data field that contains all the callback data we need to determine what kind of event is coming back and any additional data that comes with that event. A bit more is going on here. 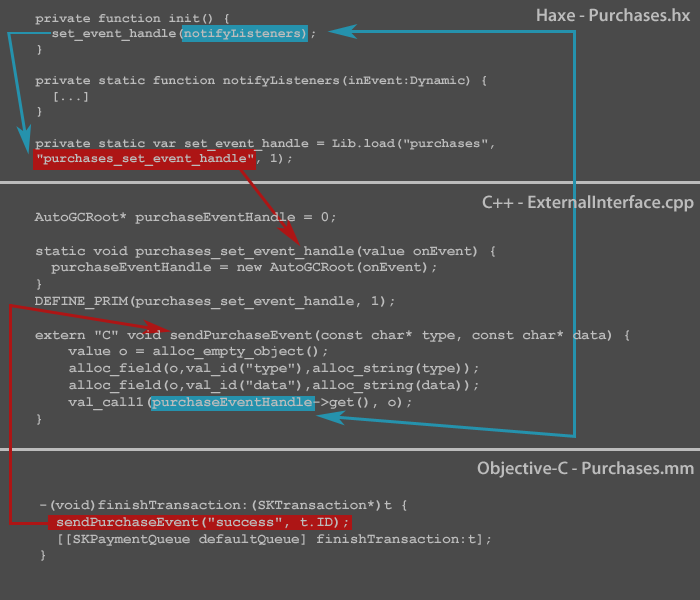 purchases_set_event_handle() is the function that sets the pointer. We called this function in Haxe (see above) and passed in notifyListeners(). sendPurchaseEvent() is a function that's called from Objective-C. It takes two String (char*) parameters. The first one tells us what kind of event we're calling. The second passes in any additional data that's relevant to the event. Everything we've talked about is summarized in the following diagram. To reiterate, this is an advanced use case where it’s best to view existing examples to understand what's going on. It sounds a lot more confusing than it really is, and there’s no better explanation than viewing the source for yourself. Calling back Haxe from Java code follows a similar line of thinking, except that instead of passing in a function pointer that gets called back, you pass in the entire Haxe class instead and call any function you want form Java. Pass in the entire Haxe class to Java by calling a Java function (via JNI). In Java, said function accepts a parameter of org.haxe.nme.HaxeObject. Calling back Haxe from Java involves doing HaxeObject.call(functionName, args). This is summarized in the following diagram. Let's walk through what's going on. First, let's peek at Purchases.hx once more. As you can see, the JNI call takes in a pointer to the entire class. 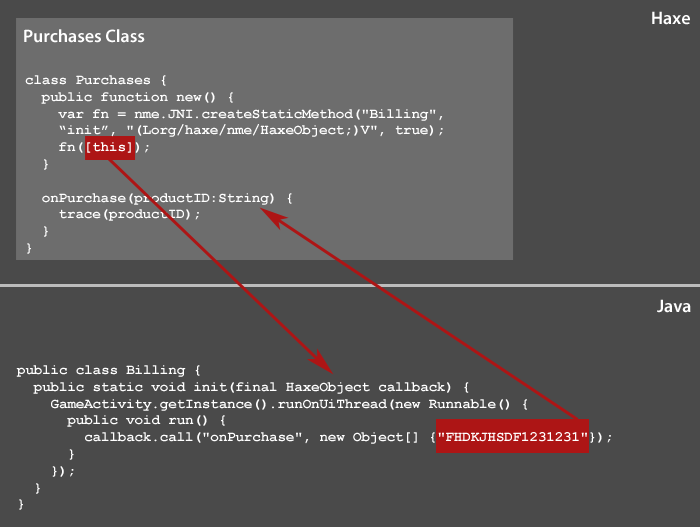 onSuccessfulPurchase() will be called from Java, as we'll see next. As you can see, initialize() takes in the Haxe class as a Java HaxeObject. It calls a function onPurchase through reflection and passes back the purchaseID of this mock purchase. runOnUiThread() is required here because these operations have to be run in sync with the UI, even though they don't have anything to do with the UI. Failure to do this may result in a crash.